The E3A toolkit uses the Energy Action Pyramid for Home, Farm and Ranch to help you make informed energy decisions. The Importance Scale Survey – While it is easy to get excited about wind turbines or photovoltaic panels, you should first understand why you are interested. You may have heard the quote by Yogi Berra, “You’ve got to be very careful if you don’t know where you’re going, because you might not get there.” The same holds true for energy – knowing your objectives and planning your actions will result in a more informed, successful investment. Energy Audit – To optimize the effect of actions you take toward your objectives, you should complete an energy audit. Energy audits help you to understand your energy consumption, efficiency, and opportunities for change – they also provide indications of cost of those changes. Energy audits can be completed through self-assessment checklists or with a formal energy audit. Audits help you to understand your situation more completely and to set appropriate priorities. 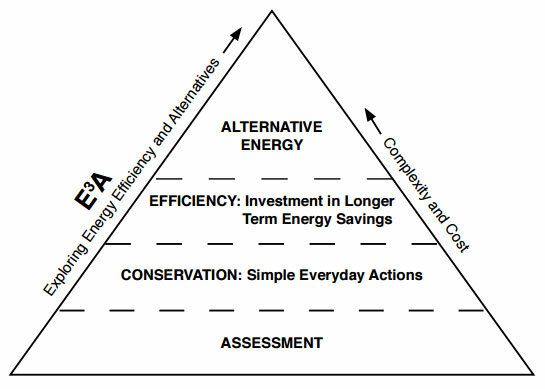 The pyramid shows that cost and complexity of energy actions typically increase as you move from energy conservation activities, to energy efficiency measures, and finally to alternative energy projects. Conservation and efficiency measures have numerous benefits by themselves, but are especially important when considering an alternative energy system. Why? The size of an alternative energy system is based on your current energy consumption. Take steps to conserve and use energy resources more efficiently and you will likely be able to install a smaller system that costs less to purchase and operate. Hot Water: Set your water heater at or below the recommended 120°F. Use the cold setting on your washing machine. Electricity: Maximize pumping efficiency on existing irrigation systems. Turn off lights, electronics, and other devices when not being used. Space Heating and Cooling: Adjust your thermostat to reduce energy use when you leave a building for more than several hours. In summer, shade east, west, and south-facing windows to reduce unwanted solar heat gain. In winter, allow solar heat gain. Fuel Consumption: On-farm, operate tractors and other powered equipment at optimum efficiency and shade fuel tanks to reduce vapor loss. At home, consider car-pooling and check for proper tire inflation. Take actions to reduce the number of miles traveled. Hot Water: Install WaterSense-labeled showerheads and fixtures. Insulate hot water pipes and water heaters. Electricity: Use variable speed drives on irrigation systems. Use surge protectors or power strips to completely turn off electrical devices that use standby power (they use electricity even when turned off). Install Energy Star-labeled appliances, machinery and equipment where available. Space Heating and Cooling: Check your building’s insulation levels and add more if needed. Have a blower door test conducted to find air leaks from doors, windows, electrical outlets, etc. Install programmable thermostats to adjust energy use automatically. Plant deciduous trees/plants that block summer sun from entering windows. They allow solar heat gain when they drop their leaves in winter. Transportation: Consider the purchase of a more fuel-efficient tractor or vehicle. Consider alternative energy after completing conservation and efficiency measures. There are many factors to consider before purchasing and installing an alternative energy system. The materials in the E3A toolkit are designed to help you understand these factors so that you can be a more informed consumer. However, you should work with a qualified installer to design, site, and install alternative energy systems.